Fifty years ago, people saw around 500 ads per day. Now, it’s around 5000. For consumers, this can be overwhelming. But for marketers, it presents a growing challenge. We need to create engaging, relevant marketing campaigns that are memorable to our audience. How do we do that? By using Google Ads. Google Ads (formerly known as Google Adwords) is an online advertising platform that lets marketers create and manage ad campaigns. These are displayed on Google’s search results pages (SERPs), their display network, YouTube, and all over the internet. Left: A typical Google search ad. Right: A banner display ad. For businesses, paid online advertising with Google Ads is an effective channel for reaching their target audience. You’re probably familiar with some of the ad formats. 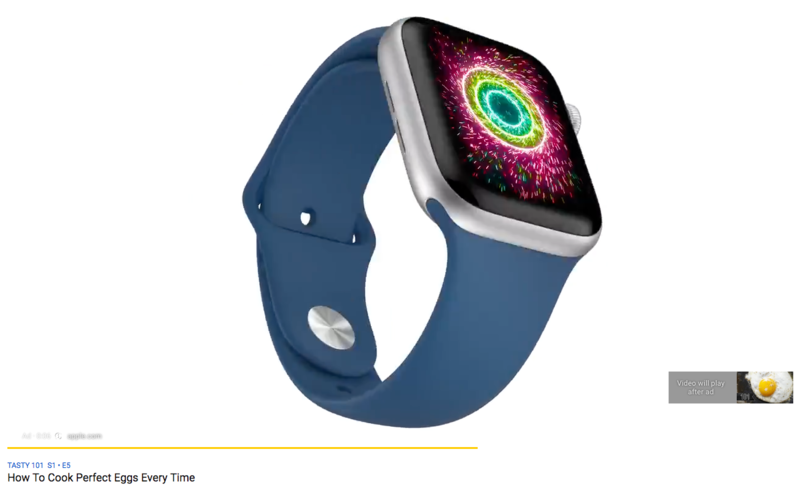 Left: YouTube pre-roll ad. 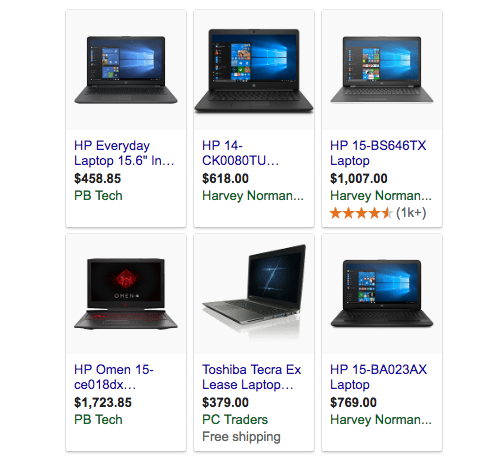 Right: Shopping ads displayed alongside search results. But why would you want your ad on a Google search results page? Just think of the number of times a person sees a Google SERP every day. For example, while looking for a place to eat lunch, I made three Google searches in the space of two minutes. 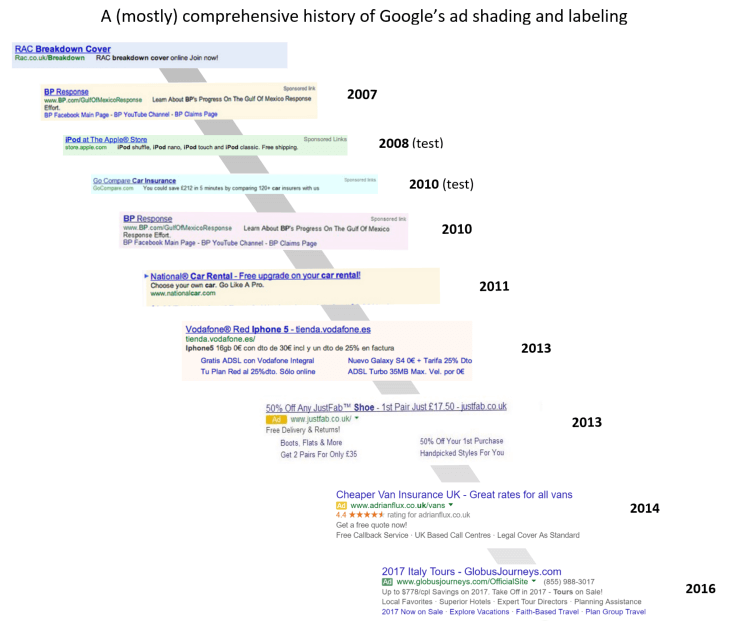 You might be thinking, “Sure I use Google, but ads are annoying, who even clicks them? I prefer organic results”. Organic results are the most relevant results as decided by Google. They haven’t paid to be there, so they’re considered more trustworthy than paid-for results. But 97 percent of Google’s $33.3 billion revenue comes from online ads. It’s easy to see the reason why. Not only are ads becoming more relevant, they no longer look like ads. About 45 percent of users can’t tell the difference between paid and organic search ads. And ads often take up most of the space on a SERP. 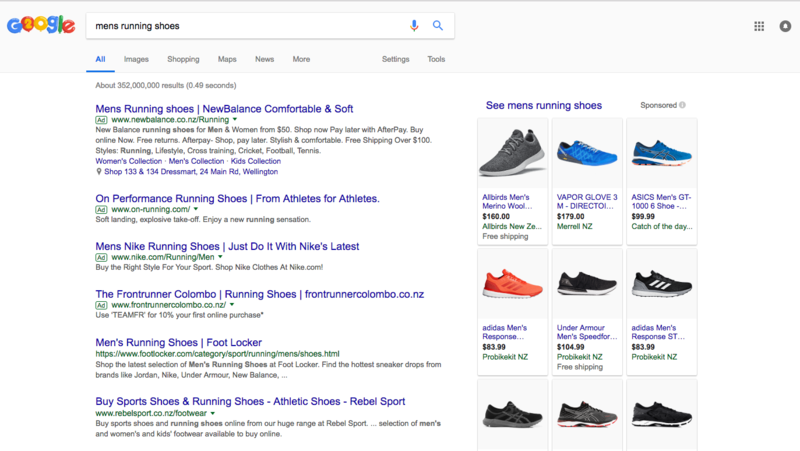 When I search for men’s running shoes, there’s little difference between the ads and the organic results. High commercial intent searches such as ‘buy flowers’ or ‘cafes near me’ generally have more ads on the SERP. This is because there’s a higher chance the searcher is ready to spend some money. On average, sponsored ads on ‘high commercial intent’ keywords take up about 85 percent of above-the-fold pixels. In the ad above, you can see four search ads, multiple shopping ads on the right, and just two organic results at the bottom. Every time someone makes a Google search, there’s an ‘auction’ among companies that have ‘bid’ on keywords or phrases in the searcher’s query. Using the Google Ads platform, advertisers bid on the keywords they value most. This increases the chances of their ad showing up on the SERP. But there are other factors involved in who gets shown, and in what order. Google wants to show the best ads, not just the ads from marketers paying the most. They decide whose ads are the best based on the quality score. A higher quality score increases the chances of the ad showing. Marketers with small budgets can beat marketers with larger budgets by creating high quality, relevant ads. For digital marketers, the Google Ads platform is vital. It allows you to target audiences with precision, reveals data about your audience and competition, and lets you trial different pricing strategies. It’s important to reach the right customer, in the right place, at the right time. For example, Dan’s student bar has a happy hour from 5pm to 6pm. Dan could choose his ‘happy hour’ advertisement to show on Google Search when these preferences are met. This means Dan spends his marketing budget only during times where there’s a high chance he’ll attract potential customers. This is why online ads are often so relevant to consumers. Google holds enormous amounts of data on what people search for. Combined with their machine learning capabilities, they have valuable insight into today’s consumers. You can find information on the current and historical search volume, keyword competition, and the average cost to bid on keywords. Google can also provide forecasts on how many impressions, clicks, or conversions you might get with a given set of keywords. When managing your campaigns, you can get up-to-date information on your best performing ads. You can also run experiments and test the effectiveness of different ad copy or landing pages. build awareness, you can pay per impression (people seeing the ad). drive engagement, you can pay only when customers interact with your ad. get conversions (for example a purchase, download, or sign up) you can choose to pay only when customers convert. This control makes it easier to align your marketing strategy with your company’s goals. You can also set daily spending limits, so you don’t go over budget. Google’s mountain of search data, and machine learning prowess allow us to create insight-driven ads using Google Ads. The result for consumers is well-made ads that are tailored to them, more relevant, and hopefully less annoying. For advertisers with smaller budgets, they can use their funds to create high quality ads more efficiently. They can quickly see what is and isn’t working, and use insights to reach their audience. Promoting high quality ads allows the voices of smaller businesses to be heard among the giants. Interested in taking advantage of PPC and online advertising for your business? Our team of experts will help you maximise your marketing budget and reach your audience. Get in touch to learn more.